What is happening is not ideal. 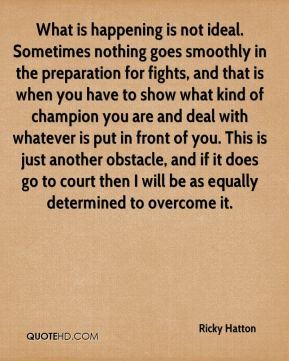 Sometimes nothing goes smoothly in the preparation for fights, and that is when you have to show what kind of champion you are and deal with whatever is put in front of you. 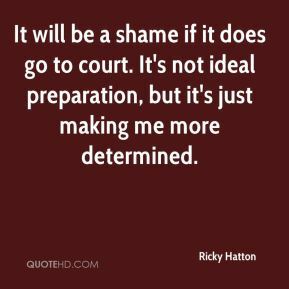 This is just another obstacle, and if it does go to court then I will be as equally determined to overcome it. 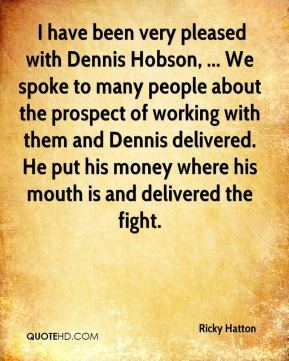 I have been very pleased with Dennis Hobson, ... We spoke to many people about the prospect of working with them and Dennis delivered. 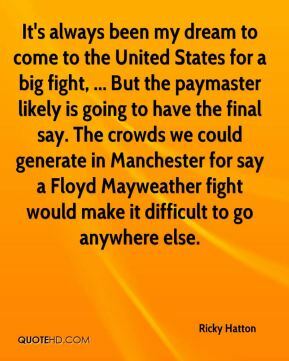 He put his money where his mouth is and delivered the fight. 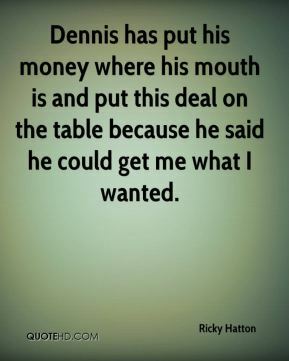 Dennis has put his money where his mouth is and put this deal on the table because he said he could get me what I wanted. I'll go gentle on him, ... I promise not to rough him up too much. I just think him saying stuff like that is just him. He's like the Junior Witter of America, he hasn't got a good word to say about anyone expect himself. Personality wise, he's very different to me, that's for sure. 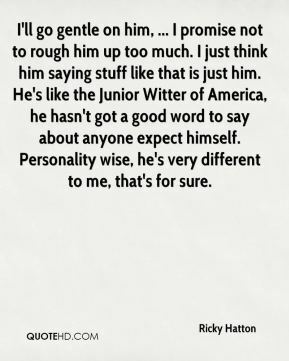 [But Hatton knows just how difficult it will be to defeat the Pretty Boy.] He's got amazing skills, ... He's pound-for-pound the best in the world, he's great to watch, skilful, lightning fast, I always watch his fights. But I don't think he's the biggest fighter in the world. I don't think he's got much physical strength. 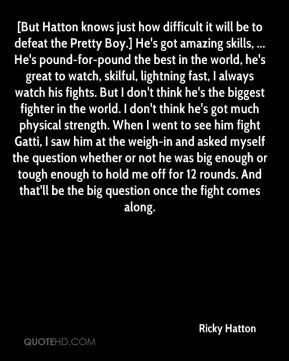 When I went to see him fight Gatti, I saw him at the weigh-in and asked myself the question whether or not he was big enough or tough enough to hold me off for 12 rounds. And that'll be the big question once the fight comes along. It will be a shame if it does go to court. It's not ideal preparation, but it's just making me more determined. I had to come to the United States to prove myself. I fought for a long time in England and a lot of people thought I was a protected fighter.